Let’s cut through the market BS. The Fed is the single most important issue for the markets… not tariffs, not trade wars, not even the economy. Remember, from 2008-20015, the US markets were completely driven by Fed policy and little else. It was Fed QE programs, combined with seven years of Zero Interest Rate Policy (ZIRP) that allowed the US markets to explode higher, despite the weakest recovery in 80 years. With that in mind, when the Fed began its attempt to normalize policy with its first rate hike in 2015, it represented an attempt to "pass off" this role to the real economy. When the markets remained elevated, the Fed then decided to accelerate the pace of normalization but hiking rates more aggressively while also introducing Quantitative Tightening (QT) in an attempt to shrink its massive $4.5 trillion balance sheet. However, fast forward to the end of 1Q18, when the Fed increased the pace of QT to $30 billion per month at the same time that the BoJ and EBC had begun tapering their own QE programs, and the market took note. In particular, the $USD began to spike higher, and Emerging Market currencies began dropping hard. This, in turn, began to blow up Emerging Market stock markets with Brazil, Turkey, and even China entering official BEAR markets, with drops of 20%. With that in mind, the S&P 500 is on VERY thin ice. 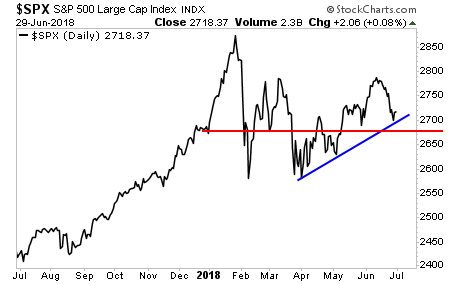 It MUST hold its trendline (blue line) and critical support (red line) or it will be joining the Emerging Market space in a 20% drop. 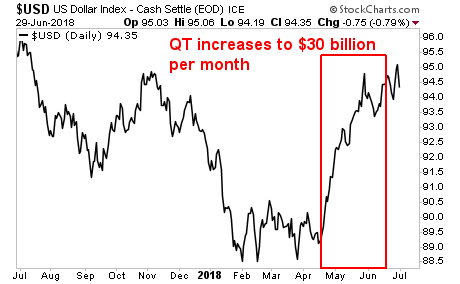 Put simply, the Fed needs to walk back its QT program NOW or else it is risking a bear market for US stocks. On that note, we are already preparing our clients with a 21-page investment report that shows them FOUR investment strategies that will protect their capital when and if a stock market crash hits. It's called The Stock Market Crash Survival Guide...and it is available exclusivelyto our clients. To pick up one of the 100 copies...use the link below.